Esophageal-tracheal (bronchial) fistula, a pathological disease, is secondary to congenital alloplasia or diseases where abnormal sinuses exist between the esophagus and trachea. These abnormal sinuses can result in food or digestive liquid flowing into the airway cavity, leading to inhibition of inhalation, severe coughing, refractory lung infection, poor quality of life, and rapid deterioration. The vast majority of adult esophageal-tracheal (bronchial) fistula cases are often secondary to acquired pathological damage, and advanced esophageal carcinoma is the most common cause. 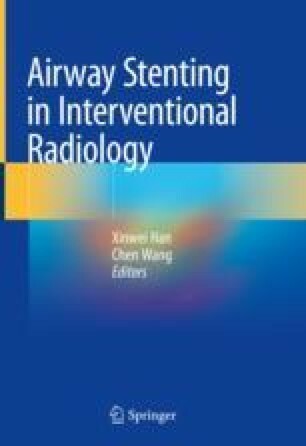 This chapter mainly describes the adult-acquired esophageal-tracheal (bronchial) fistula and the application of coated metal stent implantation in the treatment of esophageal-tracheal fistulas.